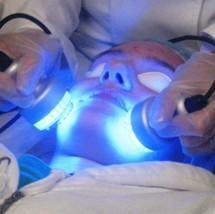 A FDA-approved, light-based treatment for acne that is an alternative to topical or oral therapies. The simple, in-office procedure is painless and only takes about 15 minutes. BLAT works by activating chemicals that pore-clogging bacteria produce to oxygenate radicals that directly kill the acne causing bacteria, Propioni- bacterium Acnes (P. Acnes). Downtime: None! Non-healthy cells unharmed.